In Paul Thomas Anderson’s Phantom Thread, Luxembourgian actress Vicky Krieps plays Alma, a young woman who captures the affections of a powerful, influential man and then spends the rest of the film dwelling in his shadow. In Raoul Peck’s The Young Karl Marx, she plays Jenny von Westphalen, who also captures the attentions of a powerful, influential man and spends the film dwelling in his shadow. The major difference is that Alma is a fictional figure while Jenny was the wife of one Karl Marx, the infamous, revolutionary socialist. If the subject matter doesn’t immediately distinguish one film from the other, then the matter of history certainly does. What ties them together in spite of their differences is Krieps. Before 2017, American audiences had mostly been deprived of her work. We caught flashes of her in Hanna, or perhaps A Most Wanted Man, but she didn’t take center stage until Phantom Thread opened wide in January. Now we get to see her once more, not quite at center stage but definitely in a role of prominence in Peck’s new film. The Young Karl Marx is determinedly a “great man” story, focused on Marx’s (August Diehl) friendship with Friedrich Engels (Stefan Konarsky), on their efforts to promote the communist cause through both activism and their writing. It’s also about the cost of Marx’s greatness, and who ultimately pays that cost. Given Phantom Thread’s proximity to The Young Karl Marx, it’s impossible to watch Krieps as Jenny without recalling her work as Alma: They have the same enduring spirit, a quiet indomitability that prevents them from fading into the background, though perhaps that’s just evidence of Krieps’ innate strength as a performer. In Phantom Thread, she has to find the character without the benefit of background. In The Young Karl Marx, she has plenty of background, but a responsibility, too, to Jenny’s memory. That dichotomy played a central part in Paste’s recent conversation with Krieps, along with her personal connection to Marx and the sobering reality of modern society’s lack of familiarity with Marxist principles. Paste Magazine: How did you end up getting in touch with [Peck]? 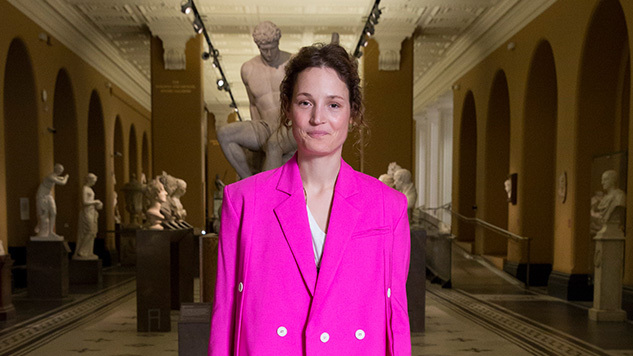 Vicky Krieps: I got in touch with him because he was looking for an actress, obviously, who could speak German and French. So I think this is what brought him to me. I don’t know exactly what he saw of me, but I remember that he or someone from the production sent me the scenes and to me, it was immediately quite clear why they sent them to me. They needed someone who could speak both languages fluently. Paste: That’s an excellent coincidence. It was meant to be. Of course, Nazis, they didn’t hate anything more than someone who would deny their helping hand, or whatever they were thinking, and then he went to the camps straight away of course. So that was also a strong connection and reason for me, you know, for my grandfather, to go and play Karl Marx’s wife. It was almost like—I don’t know, how do you call this? Paste: I would call it fate. It’s perfect. Krieps: It’s fate and it’s almost like paying justice to someone who was treated in an unjust way. Paste: Do you feel like that gave you a lot of space to find the character of Jenny for yourself? Krieps: Yes. Yes, definitely. It was very important to me. If it’s Communism, or if it’s the Nazi, or if it’s the war, I myself always need a deeper or stronger reason to tell the story than just because I’m an actress and I need the role, if you see what I mean. Probably everyone, I hope, treats it that way, but I definitely do because of my grandfather. If I take something on like this, I really take it very seriously. Jenny, to me, I took very seriously. I read almost all of what I could find about Karl Marx. At the time I was doing another movie in Austria, and also I was still breastfeeding. In the morning, I remember getting up even before everyone else, so that was probably around five o’clock, to sit and read the Karl Marx stuff, because I knew afterwards I was going to do this Karl Marx movie. So I took it very seriously, yeah. Paste: There’s almost something maybe moral about creating art like this. I don’t know if you feel the same way. Krieps: Yes, I do, especially as a woman nowadays, you know. Both characters, Alma and Jenny, are very special in their way, because they are both strong, yet both of them lived almost in the shadow of a man, and they seem to be fine with it, they seem to be OK, because they don’t need the approval or the appreciation from the outside. I think this is what makes them so strong. It’s a strength that comes from somewhere deep inside, which is a different strength, I think. For me, as a young woman today, I found it interesting to see that. I have two kids, and to see that Jenny Marx, in the end they probably had four that survived but they had many more children who died. With no money, with nothing, they would still have these children. I mean, I could have made a whole movie about her. I remember one of the things I read was the description of her when they lost I think it was the second or the third child. She came from almost royal background, you know, so she was really used to something else, and she followed this man deep into poverty. This was at the moment when they were living in London, and that was I think Dean Street. She describes how this baby died, and it was almost one year old, and I know when a child is one, it already starts to be a child. It’s not only this little creature. When it died, she said, “Our little angel, we took our little angel, we placed him on the floor,” and the family, Karl and her and their two daughters, they slept around it in a circle. It says so much about these people, you know. It means that she really knew what it meant to lose a baby. I think where they were living, other people where they were living, out of pure necessity a dying baby was not such a big deal, because people were poor and this is what happened. But she was from a different background, where babies didn’t just die. She always knew she could have saved the child, let’s say, if she had more money to get the right doctors, or to go to the coast and have some fresh air. That’s the problem I think which makes it more painful, if you know that you could actually save the child if you had different possibilities. And still she would stay with [Marx] all through her life, and she loved their babies, and at some point she had pox or something that changed her face. Do you say pox? Not chicken pox, but it was some kind of disease where your face really became horrible, and she had this. Paste: I believe people probably do still do that today, and I think it’s wonderful that you’ve played these two characters. You mentioned this earlier, but they’re kind of in the same position. Maybe you can tell me: Do you feel like playing a real character who actually existed is more challenging than playing Alma, who is made up? She doesn’t even have a backstory, really, but Jenny has a whole history. Krieps: Yes. I think playing Jenny is more difficult because you want to make it right. You don’t want to call on the ghost and then upset the ghost, you see what I mean? And Alma was in a way more free. But then, now that I speak of ghosts, you know, when I played Alma I was often thinking about my grandmother, really a lot. I wouldn’t have wanted to disappoint my grandmother, and I think this is why I also tried to be as correct as I could with Alma. But definitely, playing Jenny Marx is more difficult. You are more constrained. You have to stay in the confines of the character. Paste: Right. There’s reality there, and that reality, you’re kind of beholden to that. You kind of alluded to this earlier, but why tell that story in 2018? Krieps: One of the first things [Peck] said to me was that he was doing the movie because he wants young people from today to know what it was really about. I thought the same way as Raul. He said he wants young people to understand really the basic idea of Communism, not the political thing it became but the basic idea of saying, “Well actually, I have the same rights as this guy. Just because I was born in a different house, it doesn’t mean it’s OK for me to have no food.” And he’s right. It’s not lost but it’s kind of scary how little young people know about this, and how many young people I met who after seeing the movie who said something like, “Wow, that’s cool, that’s cool, that’s a good concept. That makes sense.” And you go, “What? You don’t know this?” You know what I mean? I was really surprised! When he said that to me, I was going, “I mean, I like the idea, but probably everyone knows.” But then when the movie came out, I saw that he was right, that there are many young people who don’t know a thing about Karl Marx, and especially if they know about him, they don’t know about this basic idea, which is just the idea of pure justice between people, which is I think the greatest and the most profound condition for society to work, you know? Paste: Absolutely. You were talking about people not having the resources to go see doctors or even to live, and that’s still a problem in 2018, which is just mind-boggling! Krieps: Exactly. It’s still a problem, and it’s still a problem that’s kept to the side, you know? We don’t talk about it a lot. We only talk about it sometimes, whenever someone needs to be elected. In the end, we don’t really talk about it. Boston-based culture writer Andy Crump has been writing about film and television online since 2009, and has been contributing to Paste since 2013. He also writes words for The Playlist,WBUR’s The ARTery, Slant Magazine, The Hollywood Reporter, Polygon, Thrillist, and Vulture, and is a member of the Online Film Critics Society and the Boston Online Film Critics Association. You can follow him on Twitter and find his collected writing at his personal blog. He is composed of roughly 65% craft beer.